MARFA, TEXAS (ANS – October 15, 2017) — I drove to Texas to see Jesus. Not the real Jesus — He’s everywhere (though I know some Texans who would argue that He is more present in Texas). No, I drove to Texas to see the Jesus Andy Warhol painted as part of his Last Supper series; the artwork Warhol spent the last year of his life painting before his untimely death post gallbladder surgery in 1987. Why Marfa? It’s a good question. High art and the West Texas Chihuahua desert don’t seem to mix. But if you think that thought, you don’t know Marfa. Marfa has become a haven for artists and creative-types, made famous by the minimalist sculptor Donald Judd (1928-1994) and the mysterious Marfa Lights (yes, they’re real: I watched them). Over the past thirty-eight years, Marfa has become the premier art center in the middle of an area known as the Big Bend region of Texas (Big Bend is the National Monument on the border of Mexico). Judd moved to the region in 1979, purchasing 340 acres of a former army base. In 1984 the Chianti Foundation opened on the site, highlighting Judd’s and various other modernist work. The rest, if you will, is history. Marfa is now what NPR calls “An Unlikely Art Oasis In A Desert Town” . I’ve always wanted to go to Marfa, but haven’t carved out the time to make the trip. But after learning that three of Warhol’s Last Supper paintings are in a semi-permanent exhibit housed in the town, the Chihuahua desert called to me. Taking my son Cailan with me on the journey, we drove the 6-hour trip south to mysterious Marfa. After passing the famous Prada Marfa sculpture in the neighboring town Valentine on Highway 90, I knew Marfa was going to be something special. For those not familiar with Prada Marfa, it’s a sculpture made to look like a Prada storefront. Created by artists Elmgreen and Dragset, the work is designated as a “pop architectural land art project” . We arrived in Marfa on a Monday, checking into The Hotel Paisano (made famous by James Dean, Elizabeth Taylor, and Rock Hudson, who stayed at the hotel during the filming of Giant, Dean’s final movie before his death). As a side note, I learned while watching a documentary on the making of Giant in the small museum near the hotel lobby that the last scene of the movie between Taylor and Hudson was filmed after learning James Dean had died in an auto accident. It gives the scene new meaning. To say the least, room 223 — the room Dean lived while at the hotel — was constantly booked by European and Japanese tourists the entire time we were at The Hotel Paisano. But I didn’t drive to Marfa to learn Dean lore; I came to peer at Jesus. To do so, the next day I walked down the street to the Brite Building. The only clue that the Warhol artwork was in the building was a sign stating Andy Warhol with the words Last Supper underneath. The windows were covered in white with signs stating no photography or video. To help me understand how three works of Warhol art arrived in Marfa, I turned to Gretchen Lee Coles, director of the Ayn Foundation in Marfa, and a reputable artists in her own right . Meeting us on Tuesday morning, Ms. Coles let us into the building. Right away, I could tell the space — and Gretchen — was engaging. As you walk into the Brite Building you’re confronted with three large Last Supper paintings. To the left is a mammoth black and white work encompassing the entire Last Supper scene. Directly in front is a large color image of Jesus next to three apostles. To the right is an image of Jesus next to a shirtless man with the words, “Be a Somebody with a Body.” That’s it: three paintings, cream-colored walls, a grid-like ceiling, and a small table at the front of the room with some literature on it. I don’t know if the room can be likened to the Rothko Chapel in Houston, but it did have a sanctuary-type feeling. Sitting at a small desk — the only furniture in the room, I began my time with Ms. Coles by asking about the Ayn Foundation, the sponsor of the work. Gretchen let me know that Ayn’s founder, Heiner Fredrich, created the space so people would interact with the artwork, not just stop by for a quick photo. It seems that Fredrich wanted a space for contemplation and reflection. Coles didn’t give much information about Friedrich other than he’s a collector, dealer, and co-founder of the Dia Foundation, which incidentally helped Donald Judd purchase the land that became the Chinati Foundation in 1979. Still living — but older, Fredrich’s family does most of the oversight of the Ayn Foundation in Marfa. I asked Gretchen how long the Warhol paintings had been in Marfa. Her answer was simple and direct, “Since 2005 when the space opened.” And how long will they be on display in Marfa? “The artwork is on a long-term, semi-permanent loan,” she responds with a smile. (Gretchen was a pure delight during our whole time together). Coles didn’t get into how or when Fredrich acquired the three Last Supper paintings represented in Marfa. 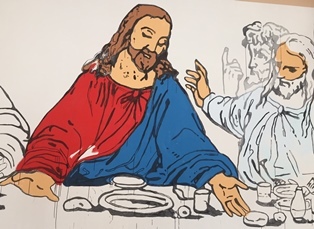 Many of the Last Supper works I’m familiar are silkscreens, but the three works in the Marfa exhibit are hand painted. I asked Gretchen about this. “True. All three of the works represented in Marfa are hand painted. Warhol used a projector to trace the images on to the canvas. He used acyclic and large, un-stretched canvas. The size of the painting is quite large, I note. “Yes. Imagine how difficult it was to ship these to Italy, “ Coles muses aloud. Coles then draws my attention to the book on the Last Supper paintings lying on the desk. As I begin to flip through the book, Coles points out a few interesting facts. One is that Warhol used an advertisement image taken from a magazine to contrast with some of the images of Jesus. The “Be a Somebody with a Body” image is juxtapositioned next to Jesus in one of the paintings in the Marfa exhibit, offering either a symbolic rendering (Jesus is God in a body) or a tongue and cheek rendering. Another interesting fact is Andy Warhol was influenced by the iconography of the church he regularly attended. 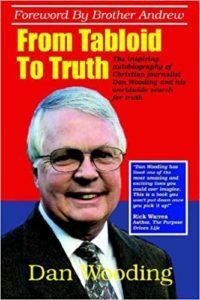 Coles recommended a documentary by Ric Burns on the influences on Warhol, including his Byzantine-Catholic upbringing . 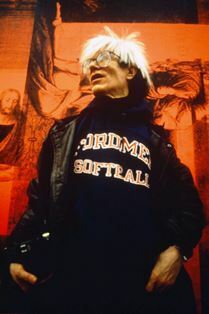 Coles notes that the documentary shows a series of repeated icons above the altar of Warhol’s childhood church; the influence of iconography upon Warhol is clearly evident. For some people, the images of Jesus and the influence of iconography may seem out of place for a man known more for his love of celebrity and quirky lifestyle. But the truth is Andy had a deep, if misunderstood, faith. Warhol grew up with — and continued to practice — the Byzantine Catholic faith. As pointed out, many scholars see a parallel between the iconography of Warhol’s religion to those of his adult, Pop-art paintings: bold colors, flat, non-perspective renderings, and repeated images, all adjudicated with iconic stature. What’s fascinating is that Warhol’s published artwork is bookmarked by Christian images: one of Warhol’s first published paintings, Golden Hand With Creche 1957, shows a hand holding a manger scene, and his last paintings were of Jesus and the Last Supper — as noted by the paintings in Marfa. Furthermore Richardson notes, “He took considerable pride in financing a nephew’s studies for the priesthood…and he regularly helped out at a shelter serving meals to the homeless and the hungry…” Not to mention Warhol’s regular church attendance throughout his life. And the author of The Religious Art of Andy Warhol, Jane Daggett Dillengerger, suggests that Warhol’s attraction to celebrity relates to his Catholic faith — the importance of the image; and, as one author has noted, “that the Last Supper series — rather than marking a new revelation of faith–actually elucidates the spiritual sensibility of his entire body of work” . Fascinating. It appears that Andy — at the bare minimum — was a believer. Warhol’s belief plays out in how he depicted Jesus. Andy’s treatment of Jesus in the works at Marfa seems to indicate reverence, or at least fascination. In all three paintings Jesus is given the central place, with the elements given a noted domicile as well (this would make sense for a Roman Catholic who believes in the centrality of the Eucharist). In one painting Jesus is the only fully colored figure, reaching his hands down to the elements of a plate, cup, and bread. In the largest of the works — a sprawling full-framed black and white representation, Jesus is the central figure, due to the imagery used by Warhol, but still of noted importance. In the Be a Somebody with a Body painting, a hand — presumably Peter’s or John’s — reaches out towards the face of Jesus. It’s an interesting question to pose: In choosing this close-up of the image, was Warhol reaching towards Jesus? We may never know. But what is known is that there’s much speculation concerning Warhol’s fixation on Jesus during his final year of life. 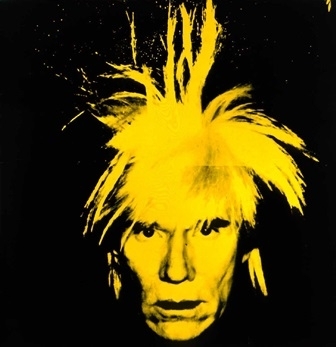 In Peter Kattenberg’s book Andy Warhol, Priest, he writes about Andy’s dialogue between the secular and sacred, noting that the Last Supper series is “essentially a ‘Yours Faithfully’” expression, an exclamation point on the entire corpus of Warhol’s work. It’s as if Kattenberg is saying that all of Andy’s iconic work was leading to the moment when Andy would paint the real icon of God — Jesus. Put in Biblical language, all the work leading up to the Last Supper was like John the Baptist, just pointing the way. But ideas like these are speculative. To my knowledge Warhol left no written statements on the interpretation of his work. He left that up to critics, scholars, philosophers, and theologians to do it for him. But that’s part of the allure of Warhol; his mystique continues with each new interpretation. And if there is something most Americans understand — at least in Warhol’s day, it’s the religious foundations of the American culture: the freedom of religion; and more specifically, a Judeo-Christian worldview. So it seems fitting that Warhol — either for religious or celebrity reasons — focused on Jesus; Jesus is la plus grande célébrité. I don’t know if I needed to drive to Marfa to come to this conclusion concerning Warhol; it’s all in books. But I’m glad I did; to a certain extent — to see is to believe. But more importantly, my time with Cailan during his final year of High School was priceless; and our experience of the Marfa lifestyle was grand (in addition to the Warhol, we took in a poetry reading, Big Bend State Park, and talked with folks at Marfa Public Radio—the only radio station we were able to pick up). And who could go to Marfa without seeing the mysterious Marfa Lights, first explained to me by virtuoso guitar player, Doyle Dykes, over tea and coffee ? Also the privilege of meeting Gretchen Lee Coles was an honor. Coles, alone, deserves greater attention. She was kind enough to take us back to her workspace, giving us a mini-tour of her art, a combination of topographical paintings intermixed with sculpture, something you’d expect from a person with a cartography and art background. And Gretchen’s final gestured gift — a book about Warhol — was but a cherry on the top of our Marfa experience and time spent with her and the Warhol paintings. Thanks, Gretchen. I drove to Texas to see Jesus, but I found something as intriguing: people dedicated to creativity and contemplation, presenting a small picture of the creator-creature process of which Jesus is the beau monde, the paradigm. I drove to Texas to see Jesus, but in a way, Jesus — the creative Christ — found me. * Though photography was not allowed at the exhibit, I was given the opportunity to shoot some close up pictures of the work, to be used for the article only. 2) Jodidio, Philip (2007). Architecture Now! (5). Slovenia: Taschen. p. 202. Photo captions: 1) Andy Warhol at the Last Supper exhibit. 2) Last Supper, Marfa, TX. 3) Close-up of Jesus’ hands. 4) Close up of the elements. 5) The Last Supper, Black and White. Marfa, TX. 6) Brian Nixon.